Oh wow! It’s the end of the weekend already. What an insanely busy weekend it’s been, too!! See! You still have a chance to take part in some! Maybe we’ll see each other! 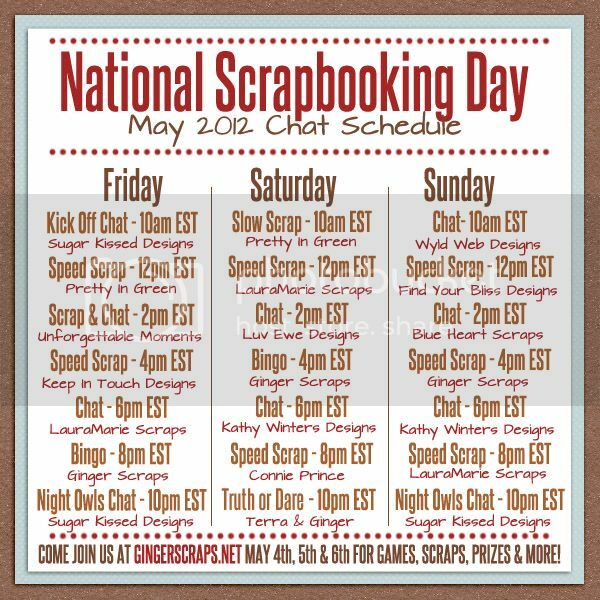 Check the forum for all the details- https://forums.gingerscraps.net/forumdisplay.php?678-National-Scrapbooking-Day!!-Let-s-Celebrate!! Did you take advantage of the bake sale too? So many designers had some amazing stuff in there! I know Psychozoe Designs had all of her buffet items listed for $1! An new buffet was also released: A Match Made in Heaven! It’s so cute and adorable. Perfect for the mother in your life, or even the baby/pet that you adore! I even caught a layout using a bus in similar colors! So many ways to use it! You know what, though? If I had to choose a favorite kit of what’s come out this week, I so couldn’t do it. Just could not do it at all! I just know that while that 50% sale is going on, you should really check it all out! Remember, if you spend $10, you get this awesome grab bag by Pretty in Green for free!! Well, I think that’s about it. I’m off. I’m actually camping with my daughter this weekend, and I know the perfect kit that I’ll be using for that! Connie Prince has this kit called Scouting is Fun. I prefer the bundle, because it has both Boy Scouts and Girl Scouts. I have a Brownie, who will be bridging to a Junior next weekend; I have a Tiger Cub who’ll be a Wolf soon, as well. So, this kit is perfect. Another good choice, I think, is The Power of YOUth collab between Pretty in Green and Kathy Winters. It’s more 4H, but it would work for Girl Scouts at least. Same principles basically. Okay, that’s enough from me! I’d love to hear from you what kits are your favorite! !